Facebook's Watch feature wants to challenge YouTube's hegemony | What Hi-Fi? In replacing Videos, the company is focusing on highlighting scripted and live programmes from outside the user's news feed - and investing in its own content. Facebook's deep dive into making video a stronger part of its platform finally has a name: Watch. 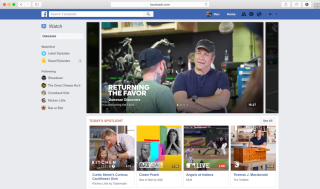 It's a new platform for shows on Facebook - but not the sort of 30-second viral content you usually see as you're scrolling through. Rather than having the "serendipity of discovering videos in News Feed", Watch is for dedicated shows - either live or scripted - that might otherwise not show up in your feed. You can subscribe to the channels, à la YouTube, and they will show up in a 'Watchlist' group. These videos are pushed by algorithms like “Most Talked About” (shows that "spark conversation"), “What’s Making People Laugh” (which is ranked by viewer use of the 'Haha' reaction) and “What Friends Are Watching”. Watch replaces the Videos tab within the Facebook mobile app, will be available on desktop, and will be turning up in Facebook's Apple TV and Amazon Fire TV apps. So what can we actually watch on Watch? Facebook's blog post mentions Major League Baseball (which broadcasts a game per week), a show by motivational speaker Gabby Bernstein, and a daily programme by 'Nas Daily' which makes content like "We bought 1000 burgers" (as showcased in Facebook's promotional video for Watch). Facebook is investing millions in its own content on its efforts to compete with Netflix and YouTube (although right now Watch seems more like the latter). The company hopes it will be able to keep people for longer in its walled garden, racking up more views and trafficking more ads. Watch is being introduced to a limited number of people in the US currently, and then moving to a bigger audience "soon".